Earlier this year, Kurt Cobain’s hometown of Aberdeen, Washington dedicated a day to Kurt Cobain, thus marking the 20th anniversary of his death with a complicated burst of city pride. The results were pretty sad. But Aberdeen is not done honoring Kurt Cobain. The local artist Erik Sandgren created a mural dedicated to Nirvana, and the city unveiled it last month. And on Saturday, Krist Novoselic spoke at the mural’s dedication. 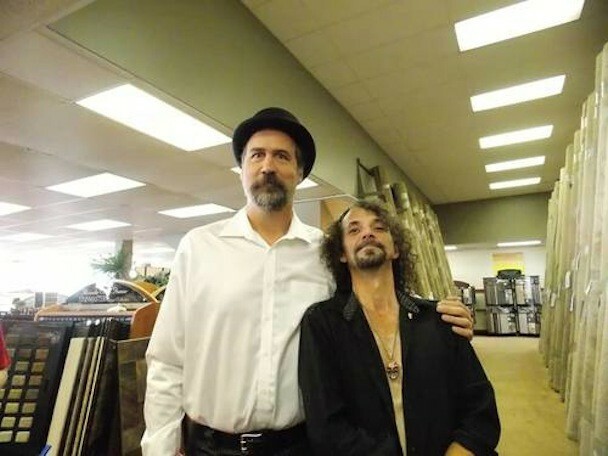 That led to the photo you see above (via Grungebook): Novoselic reuniting with original Nirvana drummer Aaron Burkhard. As far as we know, that’s the first time the two surviving members of Nirvana’s original lineup have come together in quite some time.